How do I adjust the alerts on my device? 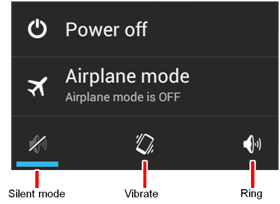 You can put the handset in vibrate mode by holding down the volume button on the right side of the handset until the handset vibrates. Touch Apps > Settings > Sound >Volumes. This opens a dialog where you can drag a slider to set the volume of ringtones that sound when you receive a phone call. Note: If you do not want the phone to vibrate make sure the Vibrate when ringing box is not checked. Touch the account you wish to modify. Note: If you do not want the phone to vibrate make sure the Vibrate box is not checked. Tip: Your alerts can be affected by different applications. One application that can adjust your tones while driving, sleeping or in a meeting is Moto Assist. Click here to learn more about Moto Assist.